You know about the Albany Public Library's online collection of local history photos, right? We highlighted a bunch of old storefront photos from downtown Albany last year -- and some of those are really eye catching because of all the signage and evidence of a vibrant retail life. But the collection also includes a bunch of old photos of residential portions of the city. And while those images don't necessarily jump out and grab you, they are kind of like flipping through an old family album. Photos of of stately old buildings when they had fewer wrinkles and less gray. Neighborhoods in their adolescence, when the trees were still short. The occasional snap from an old slice of life (trolleys!). And sometimes you come across photos of those who have passed. 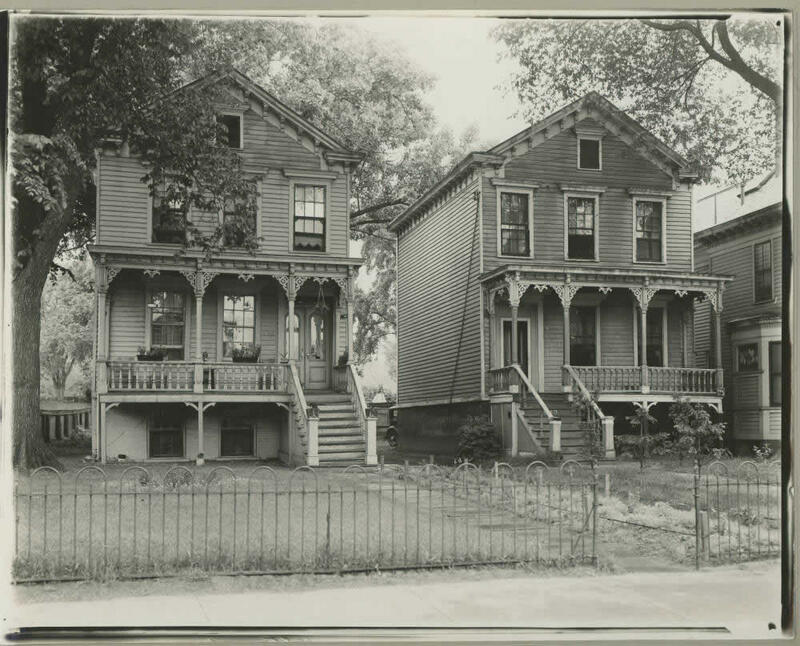 That photo above is of two homes at 843 and 845 Clinton Ave -- the photo's undated, but the metadata reports that a note on back indicates they were knocked down around 1941. We're not entirely sure where these houses once stood (maybe you know)***. The 800 block of Clinton is up by Swinburne Park -- the western end of the park is now technically 809 Clinton Ave. The old reservoir -- what's now Bleecker Stadium -- was decommissioned in 1932 and converted to the stadium by 1934, and the WPA constructed a few buildings there in the late 1930s. While flipping through the residential collection, there was something about these houses that caught our eye. Maybe it was he porches, and the iron fences, and all the little details on these houses. Maybe it was the window boxes with flowers. Maybe it was the way the trees drape gently over the homes. If you follow that link, you can zoom in on the photo and see all the little details for yourself. *** Update: Albany Archives points out that Clinton once ran farther west than it does now, and these houses were probably up near where the Rite Aid no stands on Central. If you're interested in the history of Albany neighborhoods -- and the construction of the houses in them -- Akum Norder will be giving a talk about the topic at the University Club this Friday, March 2. She's the author of the recently published The History of Here: A House, the Pine Hills Neighborhood, and the City of Albany. Thanks for highlighting this great collection. And thanks to the Albany Public Library staff for their hard work in getting this online. Libraries and cultural institutions from around the state are constantly adding new material to the site - nyheritage.org - Check it out!